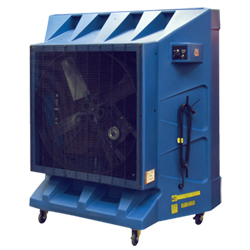 Portable workspace evaporative coolers help to keep work areas cool and at a comfortable temperature for workers. A 36" single speed fan, with a thermally protected and permanently lubricated motor, control the rate of air flow produced. The internal water reservoir holds up to 60 gallons and will operate the cooler up to 8 hours without being connected to an external water source or refilled. Reservoirs can be filled with a standard 3/4" hose and utilize a float valve and submersible pump to control water levels and flow.